Intrigued by the process of UX design? Want to learn the basics? You've come to the right place! 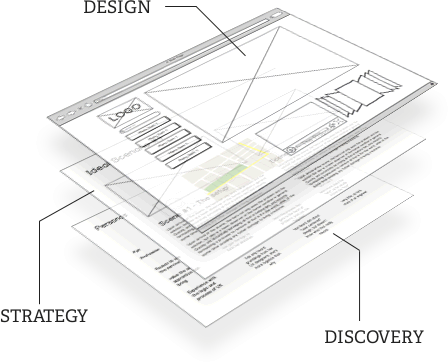 The process we illustrate has three layers: Discovery, Strategy & Design. Discover the core principles behind the art & science of User Experience design. Take your new found logic & concepts, and see how they are used in actual situations. Get off the sideline by going past mere observation, and test your new experience. Dig even deeper to find some of the best books, blogs, and other UX resources.